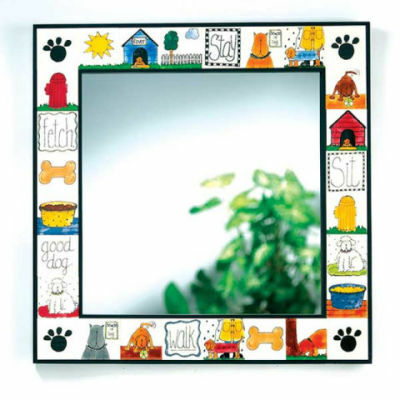 This whimsical dog mirror is framed in hand-painted tiles depicting the daily lives of adorable dogs! Handmade in the studio of Nancy DeYoung, this brightly painted mirror will enhancee any room. With drawings of paws, bones, commands, and dogs themselves, the images show the highlights of happy dogs' lives. For more information about this one-of-a-kind dog tile mirror, click here.